There is a new game mode being added to Fortnite tomorrow! And no, this isn’t a just a fun feature mode for Battle Royale, this is a fully fledged standalone game mode that will sit beside the ever popular Battle Royale mode and Save the World. The new game mode is essentially a more feature-rich version of the popular ‘Playground’ mode that was added and subsequently removed from Battle Royale a little while back. 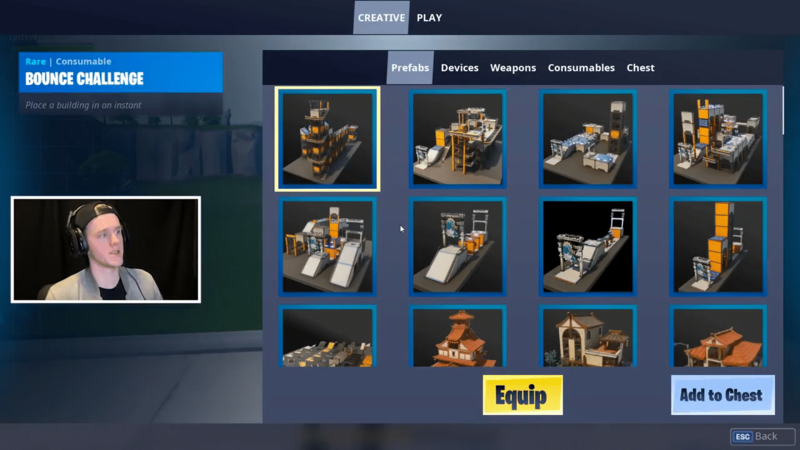 The new mode, titled ‘Creative Mode’, and will allow players to create not only their own maps but also mini games, training courses, and basically anything your imagination can think of. In Creative Mode, you have the ability to interact and edit anything on the map, and you’ll also be able to build anything your imagination can think up, and there’s tonnes of prefabs to get you started. The only limit you’re bound by is the memory limit which is capped at 100,000, which is presumably in place to stop players building maps that have too may objects which, in turn, could crash the server. That being said, it would take a lot of items to hit the 100,000 limit, so you shouldn’t ever feel blocked from building what you want to build. As with any creative mode, you’ll have unlimited resources to build whatever you like as well as having god powers, such as flying. As well as simply building your own island you can also view highlighted creations from the community via the ‘Hub’, which can be accessed by travelling through rift teleports that are found around the edge of the map. Once you have created or loaded another players map you can then play mini games, such as Deathmatches or FFA’s. Again, as with the Creative Mode, you will have god powers on the server and will be able to change settings, such as the ability to turn off fall damage or have infinite ammo. As a side note, once the mini game has ended the map will revert to how it was previously i.e. all map damage will be reversed. The news of the new creative mode was supposed to be unveiled at the Game Awards, however, YouTuber Lachlan (who was provided early access) leaked the game mode on YouTube (the video has now been removed). Since the leak, Epic has officially stated that the game mode is coming tomorrow for players that have purchased the Season 7 Battle Pass, and for everyone else it will launch in one weeks time; the game mode will be free rather than paid-for like Save the World.